The tidal wave of Steam Machines promises to be unstoppable, but Digital Storm is determined to stand out from the crowd – by going hybrid. The Bolt II, Digital Storm's small-form-factor gaming PC for the living room, will unite both Windows and SteamOS. It's also the first liquid-cooled Steam Machine, according to Digital Storm. 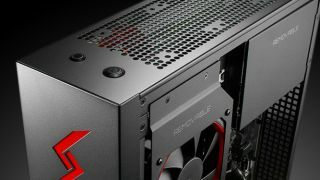 It also says this one is "infinitely more upgradeable than any other SFF computer on the market" – you'll be able to swap out everything from the graphics card to LED lighting inside the box. Expect to be able to get your hands on this one later in January, with a starting price of (get ready for it) $1,899 (about £1,157, AU$2,120). But splashing that cash will get you a "best-in-class" 240mm radiator to cool the overclocked processor. Meanwhile you'll be able to take command of the system's cooling using the HydroLux control board. Rajeev Kuruppu, Digital Storm's Director of Product Development, said that the aim is to target "consumers that demand the best possible gaming experience and who are looking for a PC capable of playing any title on their new 4K display." We'll say. We've reviewed the Digital Storm Bolt II!